Bring the payment to a location that cashes money orders. Common options include banks, credit unions, grocery stores, and check-cashing stores. Endorse the money order by signing your name on the back. Wait until you are indoors and ready to hand the money order to a teller or customer service agent before signing. For more detailed instructions, see how to endorse payments. Show valid identification to verify that you are authorized to cash the money order. Government-issued IDs, including driver’s licenses, passports, and military IDs are sufficient. Pay any fees for the service. These costs will reduce the total amount of cash you receive. Get your cash and place it in a secure area before leaving the customer service counter. ﻿If you don’t need all of the cash right away, you can deposit money orders into a bank account and withdraw cash later as needed. You can cash money orders at a variety of locations. Your best option is usually a bank or credit union that you already have an account at. 1. Your bank: Your bank or credit union probably provides this service for free. However, you might not be able to get the full amount of the money order immediately. Your bank’s funds availability policy will explain how much, if any, you can take immediately, and the rest of the funds should be available within a few business days. For legitimate USPS money orders, the first $5,000 may be available within one business day. For other money orders, the first $200 may be available immediately. Visiting a branch might not be convenient. But if you belong to a credit union, you can probably use a branch of a different credit union that uses the same shared branching network. 2. Money order issuer: If you don’t have a bank account or you can’t get to a branch, try visiting a location of the money order issuer. The issuer is the organization that prints and backs the money order. For example, you’d visit a post office to cash USPS money orders or a Western Union office to cash a Western Union money order. Working directly with the issuer will help you minimize fees and increase your chances of getting 100 percent of the cash quickly. Be aware that some places won't give you cash if you're not a customer or if they didn't issue that particular money order. 3. Other options: You can also try to cash money orders at retail outlets like check cashing stores, convenience stores, and grocery stores. In fact, retail stores often have Western Union or Moneygram services available at the customer service desk, so you might be able to get the entire amount of cash for free. If not, a customer service representative can discuss check cashing options with you. For more ideas, see where to cash a check. If you don’t need 100 percent of the money order in cash, a smarter move is probably to deposit the money order in your bank account (instead of cashing it). You can get cash later if necessary— but why not keep the funds safe in the bank until then? You're less likely to spend the money if you're not carrying it around with you, and it won’t get lost or stolen in the bank. Where should you deposit a money order? Use your existing checking or savings account, and transfer the money elsewhere if you have other uses for it. If you don't have an account at a bank or credit union, you can use this money order for your initial account opening deposit. Having a bank account will likely save you money and time over the long-term. Logistically, depositing a money order is the same as depositing a check. Endorse the back of the money order and list it separately (as a check) on your deposit slip. If you use your mobile device to deposit checks, you may find that money orders are treated differently. Banks often require that you deliver the original money order to your bank for processing, and they don’t allow mobile money order deposits. Verify with your bank before you try to make a deposit. 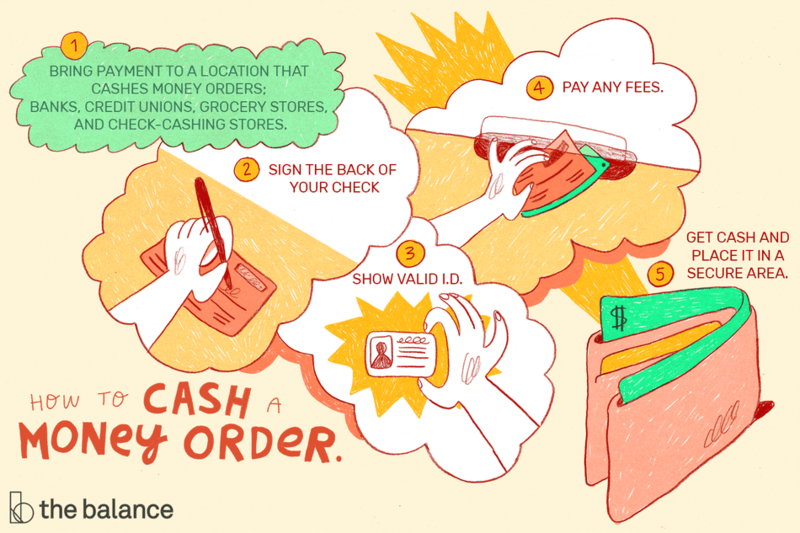 Expect to pay a fee when you cash a money order anywhere except your bank—unless you’re cashing a USPS Money Order at the post office. You'll typically have to pay several dollars in transaction fees or a percentage of the total proceeds. Those fees can add up, especially at check cashing stores and convenience stores, which may have higher charges. If you receive more than one or two money orders per month, it’s probably worth opening an account at a bank or credit union—even if they charge monthly maintenance fees—instead of using retailers. Once you’re a customer, you can go to your bank and cash checks or money orders anytime you want without additional charges. If this is the first time you've received a money order, you may wonder what you have on your hands. A money order is similar to a check (in appearance as well as function), so you can treat money orders just like checks made out to you. You can’t spend money orders payable to you—they are just pieces of paper that promise payment from funds in somebody else’s account. To get access to those funds, you have to cash the money order or deposit the money order into your bank account. For a more detailed explanation of the benefits and limitations of money orders, see Money Order Basics. Money orders are often used in scams. If you want to make sure you’ll be paid, verify that the money order is legitimate before accepting it. You can never be 100 percent certain, but you can identify most scams by calling a money order issuer to verify funds. Whatever you do, never accept a money order for more than you have asked. Cash it, and send the excess funds back to your “customer.” This is almost always a scam. Once you've verified that a money order is legitimate, do something with it (cash it or deposit it) quickly if you are concerned about fraud. It is possible for your buyer to cancel the money order after sending it to you. If you cash the money order with the issuer, it can’t be cancelled. But things can get confusing if you take money orders to your bank—your bank might give you cash or credit your account, but the bank can still reverse the transaction later.